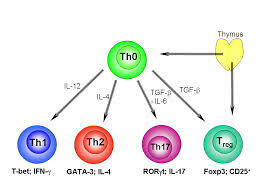 In animal studies, vitamin A deficiency induces a shift from type 2 (humoral, Th2) to type 1 (cellular, Th1) cytokines; there are no similar data for humans. Control of human immunodeficiency virus (HIV) and Mycobacterium tuberculosis infections requires type 1 cytokine (cellular) immunity. These infections and vitamin A deficiency are highly prevalent in Africa. We therefore examined the interactions among serum vitamin A levels, immune parameters, HIV infection status, Mycobacterium bovis BCG vaccine scarring (as an indicator of a type 1 cytokine profile), and clinical findings for 70 hospitalized children in Malawi, Africa. Directly conjugated monoclonal antibodies and flow cytometry were used to assess cell-specific cytokine production by peripheral blood monocytes and lymphocyte subpopulations. The statistical techniques employed included nonparametric statistics and logistic regression analyses. Thirty percent of the participants had severe vitamin A deficiency ( or = 20 microg/dl). Vitamin A levels were lower for HIV-positive than for HIV-negative children (median, 10 and 17 microg/dl, respectively). Vitamin A-deficient children for HIV-negative children (median, 10 and 17 g/dl, respectively). Vitamin A-deficient children (<20 g/dl) were more likely than non-vitamin A-deficient children to have higher proportions of natural killer (NK) cells (median, 8.3 and 5.2%, respectively) and lower ratios of interleukin-10-producing monocytes to tumor necrosis factor alpha-producing monocytes after induction (median, 1.0 and 2.3, respectively). Vitamin A-deficient children were also more likely than non-vitamin A-deficient children to exhibit respiratory symptoms (47% versus 12%) and visible BCG vaccine scars (83% versus 48%), which are indicative of a type 1 response to vaccination. Vitamin A status did not vary with gender, age, incidence of malaria parasitemia, blood culture positivity, or rates of mortality (6% of vitamin A-deficient children died versus 20% of non-vitamin A-deficient children). Lower vitamin A levels were associated with a relative type 1 cytokine dominance and proportionately more NK cells, both of which may be somewhat beneficial to persons who are exposed to HIV, M. tuberculosis, or other type 1 pathogens.